" Emporium - San Francisco, California - C. 1908 to 1915. " 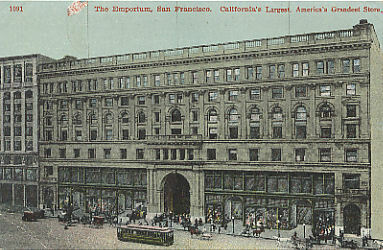 (1762) POSTCARD: The Emporium - San Francisco, California - C. 1908 to 1915. -Condition: Good Plus. - Not Posted. Picture of front of Emporium with carriages, horses, and street cars. I think this was done after the Earthquake in 1906. The building looks the same before the quake and after the quake. It was destroyed by fire during the San Francisco earthquake and it took two years to rebuild. The store was originally started in 1896. Price: $4.00 + shipping.